We already have good direct evidence that selection favors yucca moths who closely match the local Joshua tree population. Joshua tree’s pollinators are entirely dependent on the plant as a food source—they don’t eat nectar or pollen like many other pollinators, but Joshua tree seeds. Female moths lay eggs in Joshua tree flowers, then deliberately pollinate them using pollen carried in unique, specialized mouthparts. When the fertilized flowers develop into fruit, the moth eggs hatch, and the emerging larvae eat some of the seeds inside the fruit. If the pollinating moths do too much damage to the flower in the course of laying their eggs, the flower dies off—which helps keep the moths from over-exploiting the relationship by laying lots of eggs or delivering too little pollen. This also means that moths with over-long ovipositors, the appendages used to drill into the flower to lay eggs, may do more damage than necessary and risk killing the flowers they pollinate. As it happens, the two types of Joshua tree have differently-shaped flowers, and the two pollinator species differ in their ovipositor lengths—and moths with overlong ovipositors can’t successfully raise larvae on small-flowered Joshua trees. The new analysis compares moths’ ovipositor lengths and measurements of Joshua tree flowers from across the entire Mojave Desert, where both are found. The two moth species differ significantly, and so do trees from populations pollinated by different moths species—as we’ve previously found. But because the dataset is more detailed than before, we could also look at how variation is distributed within the two types of Joshua tree and the two pollinator species. The answer almost feels disappointing: within tree types or pollinator species there just isn’t much variation. In fact, the variation we can detect seems to be random—just statistical noise. That may mean our measurement methods are too imprecise to detect fine-scale patterns in Joshua tree and yucca moth populations. But it’s also what we would expect if Joshua tree and its pollinators were under strong selection to match each other. Natural selection against less-well-matched moths and trees should eliminate heritable variation in moth ovipositor length and Joshua tree flower shape from natural populations. This would leave only non-heritable variation due to causes like developmental errors and environmental effects, which are random with respect to the local plant or pollinator population. This is the pattern predicted by the mathematical model of coevolution I’ve just published with Scott Nuismer: when coevolution favors closer matching, it should act to reduce variation within the interacting species. The connection was striking enough that we decided to discuss the theory result in a press release about the new Joshua tree study. Coevolutionary constraint might seem to reduce the chances for speciation in interactions like those between Joshua tree and its pollinators. 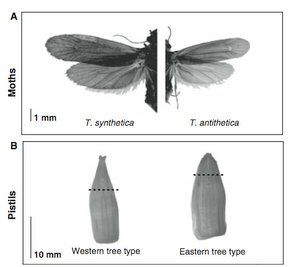 However, constraint might also act to reinforce isolation created by other means; we already have good reason to think that it helps prevent the yucca moths from cross-pollinating the two forms of Joshua tree. 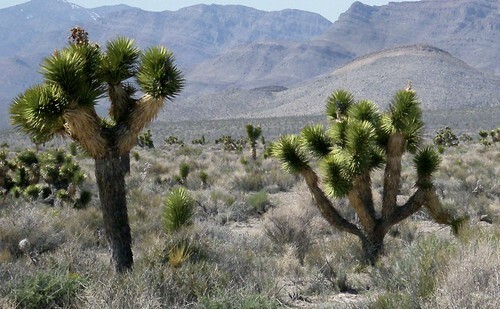 This entry was posted in coevolution, evolution, my research, science and tagged Joshua tree, Research Blogging by jby. Bookmark the permalink. The trick, it seems, is to set firefox to accept third party cookies. Well, it is a personal blog. Shameless self-promotion is kinda the point.